The UK possesses thousands of old buildings whose origins stretch back centuries. Dwellings make up by far the largest proportion of listed and historic properties and while houses older than the 15th century are relatively rare, those from the late 16th century onwards survive in significant numbers. Many period homeowners are interested in learning the history of their building, but it can seem a daunting task when you aren’t sure where to start. There are many professional architectural historians you can commission to undertake the research for you; however, tracing the history of a building yourself can be very rewarding. The more you know and understand your own home, the more you will appreciate its value, admire its quirks and make appropriate changes that respect its history when renovating. If you live in a listed building you will likely already have gleaned some basic information from the list description which gives the best estimate of the date of your house as well as indicating why it is listed. However, list descriptions can be very brief and it is worth remembering that most listed buildings were not surveyed extensively externally, or usually at all inside, at the time of listing. Treat the description as a starting point and not as concrete evidence. Often it isn’t an adequate basis for undertaking informed work so doing your own investigation is a good idea. The process of dating a historic building is usually achieved through interacting both with the building itself and also with archival documents and published studies of buildings. Broadly this can be split into three methods of dating: style, records and physical evidence. Understanding the evolution of building design and style is a good place to begin your research. There are many books and guides on the history of buildings. The style of a building and its details provides important clues about its age, use and development over time. Ask yourself if this a practical or vernacular building that has been built informally (without an architect), or is this a building that has a clear design intention or aesthetic? Style should not be the only factor in determining a building’s age. We usually have a good idea of when a certain style was introduced but it’s harder to determine when they fell out of favour. Also, most historic buildings evolve over time as the owner’s needs and expectations change. New features such as fireplaces, doors or even whole facades may have been added to an older house. This also follows for date stones, which may have been added later to a building after a new phase of alterations. When trying to establish a date for a property from primary sources it is often easiest to work backwards. Comparing historic OS maps can be a good way to establish when a building was erected on your land but it doesn’t mean that the building there today is the same building. At a national level Historic England Archive, containing millions of photos and thousands of measured surveys, is a good place to find details on your home if it is included. However, in many cases it is the local library and archives which may produce better primary resources. Town, parish or country histories are a good way to understand the development of your area. Some areas of the country have had land registration since the 18th century. Having undertaken a survey of the primary sources and some literature on the history of building evolution, you can then explore the style and physical evidence of your home. Encompassing medieval, Tudor and Stuart architecture, a pre-Georgian house is a precious and wonderful thing. Pinning down an exact date for a pre-Georgian building can be very difficult. With this particular time period in architecture the subtleties make all the difference. Construction techniques and early design aesthetics often took time to reach areas of the country as the styles usually originated from London and migrated out. Regional differences in materials and construction also come into play. Dating is best done by looking at the plan-form of your building and understanding the materials used in its construction. Before the 16th century, life in most houses revolved around the hall – not an entrance passage as it is now but a main room open to the rafters. A fire would burn in the middle of the hall’s floor with smoke drifting out through an opening in the roof. Open halls began to be phased out by the later 16th century, with upper floors and chimneys introduced, but houses with medieval origins often retain tell-tale smoke blackening to the roof timbers. In the medieval period, only the best buildings were made of stone and most domestic buildings were timber framed or had earth walls. Masonry structures became more common from the later 16th century. Brick started to be used for chimney stacks and the infill to timber frames. Thanks to advances in the transportation of buildings materials, by the later 17th century, buildings entirely of brick started to be built. The Georgian period of architecture spanned from 1714 to 1830 with the later Georgian period starting in 1830 and ending in 1837. Houses built in this period are recognisable from the outside by their generous, symmetrical proportions, with flat or shallow roofs hidden behind a parapet. They may be built in stone or brick and earlier buildings may have a stucco-rendered ground floor with later Regency variations being rendered entirely in stucco. During this time, sash windows became the norm and mullion windows ceased to be fashionable. The classic arrangement has three panes across by two up on each of two sashes, giving a ‘six over six’ panel window, although this is by no means a fixed rule. Over time, glazing bars also became thinner, as glass became lighter – the finer the glazing bar the later the house, usually. From a structural perspective much inspiration stemmed from the classical Palladian style in this period, which can be seen in the use of the classical orders and proportions in Georgian buildings. Inside the building, this is the period in which decorative plasterwork reached the height of intricacy and elegance, with fine cornices and ceilings. At this point it is worth noting that as the style of older timber framed buildings became unfashionable there are examples of older buildings refaced in a Georgian façade. It is possible to have a pre-Georgian building with a Georgian primary elevation. From humble cottages to resplendent mansions, more than four million Victorian properties survive today – an incredible one in six of all UK houses. Most were terraced. These were economically efficient to build and were a strong structure, with each house supported by its neighbour. While Victorian houses do often follow some of the classical features adopted by the Georgians, Victorian style was also influenced by the renaissance and Gothic Revival movements. The Victorian era and associated industrial revolution introduced many changes to society and the way homes were constructed. As a result differences can be seen between early, mid and late Victorian homes. One of the great delights of Victorian houses is that even ordinary terraces were built as cheaper replicas of grander buildings and design was very much concerned with reflecting status. To impress guests entrance halls would boast ornate ceiling plasterwork and patterned tiled flooring. The most prestigious room was the front drawing room where a bay window and ornate fireplace would signify status. Victorian houses were remarkably consistent in their internal layouts, being relatively narrow in width, with a fairly standard ‘three-room deep’ plan accessed via a deep corridor. Wider, double-fronted houses were the exception. Upstairs, the layout of the bedrooms echoed the pattern of the ground floor, but because kitchen floors and ceiling heights were lower to the rear of the property, the layout also had to be ‘split-level’ upstairs, with steps down into the back rooms. The social pretence of announcing visitors in a resplendent hallway was, by necessity, dispensed with in many smaller dwellings. Here, the main door from the street would open straight into the front parlour or, in semi-detached houses and end terraces, into a small lobby at the foot of the stairs from a side entrance door. To save space, in cramped workers’ cottages the kitchen sometimes occupied the back parlour, with a small adjoining scullery and outside privy. In the majority of such homes, the stairs formed a partition between the front and back rooms. From the exterior, a Victorian property can be recognised by the inclusion of bay sash windows, terracotta tiles, decorative stonework and polychrome brickwork. The introduction of cheaper and stronger plate glass from the 1830s reduced the need for glazing bars and so the sash window evolved to become one large sheet of glass in each sash. However, the increased weight of the glass and the absence of any internal supports necessitated the introduction of ‘sash horns’ on the upper frame. These are extensions of the window stiles that helped to strengthen the vulnerable frame joints at either end of the meeting rail. A lot of sash windows in Georgian buildings were adapted to single pane sashes or replaced in favour of this style altogether so you may have a Georgian property with Victorian sashes. Use our guides on renovating a Victorian house and extending a Victorian house to find out how to make sympathetic alterations. Georgian influence is still evident in elegant terraces with slate-clad shallow roofs hidden from the street behind low parapet walls, and smooth, well-proportioned façades with symmetrically arranged windows and doors. Main walls were commonly rendered with stucco, but with classical ‘Italian villa’ features, such as string courses, arches, and cornerstones. Some more expensive houses have façades made from smooth ashlar stonework. Sash windows still have multiple panes. The standard plan comprises two rooms over three floors, with single-storey rear additions. Many larger townhouses still had basement kitchens, with imposing front steps leading up to the main entrance. Classical Italianate styles compete with increasing Gothic influences. Traditional slate roofs are topped with decorative terracotta ridge tiles, and pointy finials supersede Georgian hidden parapet roofs. Exposed brick or stone walls eclipse white fully stuccoed frontages, and façades feature contrasting colours of brickwork, with string course bands and arches of mainly red or yellow brick. Large polygonal ‘splayed’ bay windows appear, initially single storey, with two storey common from the 1870s. Sash windows now just have one or two larger panes, while window and door surrounds become more ornamental, and manufactured stone lintels and sills start to replace brick arches and sills. Townhouses with semi-basements were still common by 1870, with imposing flights of steps up to the front door, but full basements had largely disappeared, superseded by deeper layouts, with long corridor layouts. Rear additions sprout another floor or two, occupied by bedrooms. Outdoor WCs or privies were a feature in most mainstream housing, with internal bathrooms in some more expensive properties. By the mid-Victorian period there were two powerful architectural forces at work. You were either a ‘Goth’ or an Italianate neoclassicist. In contrast to the Georgian emphasis on symmetry and the unity of whole terraces, the Victorians were more concerned with promoting individuality, breaking up terraced frontages with prominent bays and porches. The neoclassical style was strongly influenced by medieval Italian architecture, while Gothic inspiration was derived from medieval cathedrals. Inevitably, speculative builders pinched ideas from both camps, and by the 1850s elements of Italianate and Gothic had crept into many streets. Loosely based on the design of Roman villas, these included shallow hipped roofs and big overhanging eaves supported on brackets. Rounded brick arches were set above paired windows, with carved Roman columns to bays. Showy contrasting coloured brickwork included red and yellow bands, and corners highlighted with white stuccoed quoins. Grander houses might boast a tower or ‘campanile’, emulating the taste of the Royal family. Inspired by the architecture of medieval cathedrals, examples were pointed arches over windows and doors, pointed gable walls with massive carved or moulded bargeboards, and church-like stained glass. Steep slate roofs may have sprouted church belfry towers, perhaps sporting a discreet gargoyle, while bays and front porches saw Gothic columns with carved foliage. Brickwork was often in contrasting colours. From the 1890s, Queen Anne revival was a major influence on mass suburban house design, featuring red brick with white stone dressings, or white painted joinery. Later Arts and Crafts styles saw tile-hanging, white painted roughcast and pebbledash, and large overhanging gables over stout square bay windows. Elaborate timber porches featured coloured glass in front doors and black half-timbered ‘mock-Tudor’ gables. Upper sashes were now divided into multiple panes, but wider casements were becoming popular, some of cast iron with leaded lights. Small coloured blue or red panes were popular in fanlights and windows adjoining doors. Roofs were built to a steeper pitch. The demise of slate came towards the end of the century as affordable manufactured clay tiles become fashionable. Most houses now featured internal WCs and bathrooms, except in the poorest housing. The Edwardian period was relatively short (1901-1910) and was heavily influenced by the Arts and Crafts movement. The movement promoted simple design and an appreciation of handmade fixtures and furniture as a reaction against the mass-production and industrialisation of the Victorian era. Due to the rapidly increasing population and completion of new railways lines Edwardian houses tend to be found in the suburbs; they are often situated on larger plots of land and set back from the street. 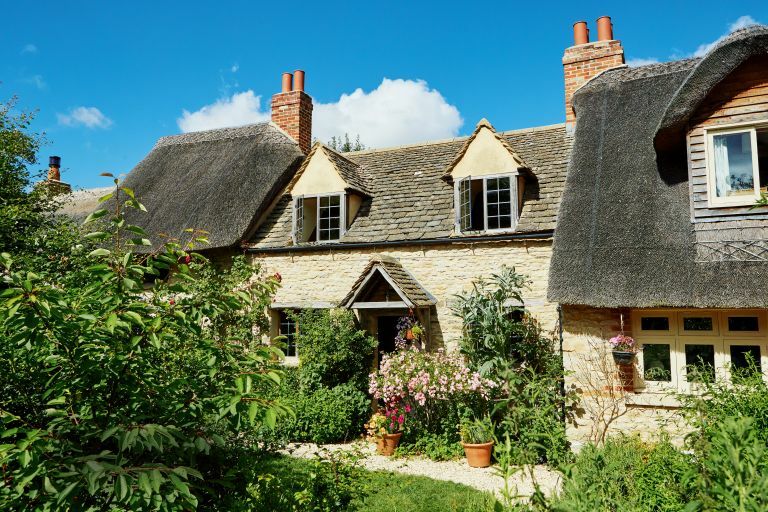 They generally sit less deep in their plots than Victorian houses and are defined by gable roofs, deep bay windows, and sash windows with smaller decorative panes. An enthusiasm for ‘old England’ was expressed in idiosyncratic revivals of timber-framed and mock Tudor homes. Internally it is common to find wide hallways and dual-aspect rooms. Edwardian layouts become wider, with squarer hallways. Kitchens were now tucked into the main house or in shallower rear additions, and separate sculleries were phased out.